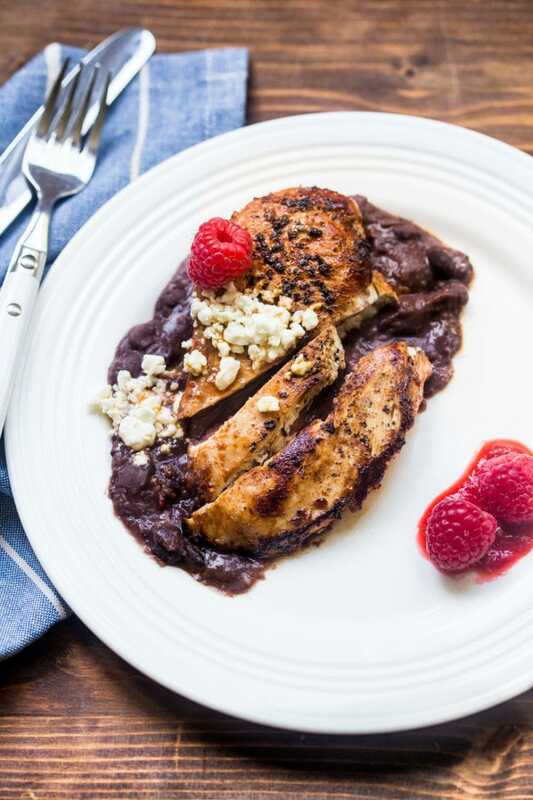 Raspberry chipotle chicken is your new dinner for two recipe that uses your favorite flavor combo: raspberry chipotle sauce! I’m working with Driscoll’s to bring you this raspberry’licious recipe today. Visit them for more berry recipes, and enter their Sweetest Berry sweepstakes! There for a while, we ate black bean raspberry chipotle dip with a basket of chips almost every Friday night. Let’s backup: I lived outside Kansas City for 18 months a short while ago, and I was introduced to black bean dip laced with raspberry-chipotle sauce, topped with whipped cream cheese. If you’re from Kansas, you are screaming ‘So Long Saloon in Manhattan, Kansas!’ at the top of your lungs. Yep, it’s that restaurant I’m referring to. Dana summed it up best with her recipe for it. This is a riff on that dish, expanded into an entire dinner serving, because that’s how much I love the combination of smoky chipotle, sweet raspberries, and creamy cheese. 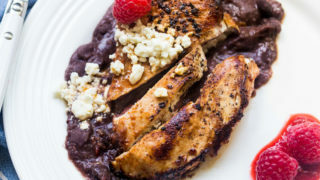 This raspberry chipotle chicken is my love letter to Kansas. This 5-ingredient dinner for two has been on heavy rotation around here lately. 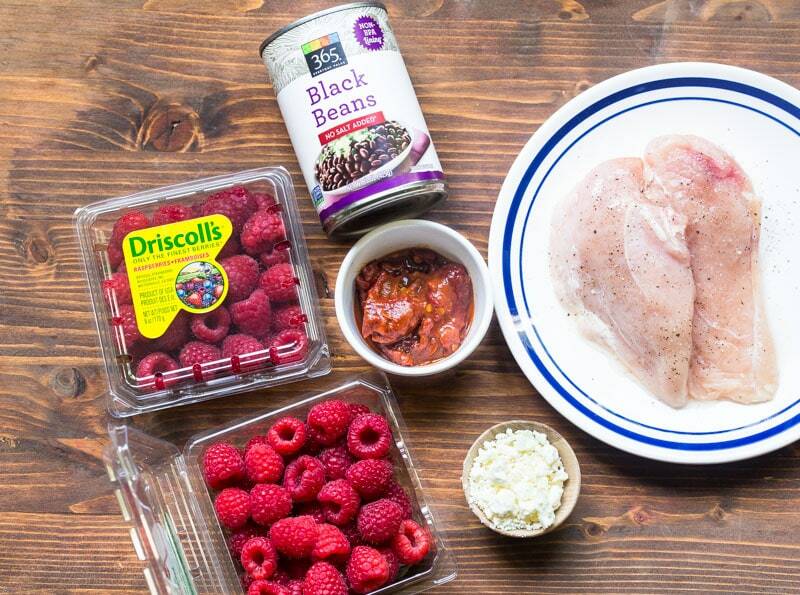 You need: 2 chicken breasts, 2 packages of raspberries, canned chipotle peppers in adobo sauce, and a can of black beans. You’ll also need salt, pepper, butter, and olive oil from your pantry, but those are a given, no? First, make the raspberry chipotle sauce. Puree the raspberries with as many chipotles as you can handle. I started with 3, did a little taste test, and added 3 more. Seeds and all, baby. Next, I poured the puree over the chicken to marinate. You can leave the chicken in this mixture for 1-24 hours. The longer the better, baby. I’m going to stop calling you baby now. I used about 3/4 of the raspberry sauce to marinate and baste the chicken as it cooked. I added the rest to the can of black beans while they warmed on the stove. You could save a little sauce for garnish too, if you like that, baby. I swear I’m done this time. But at least I made you an amazing 5-ingredient chicken dinner for two, ok? 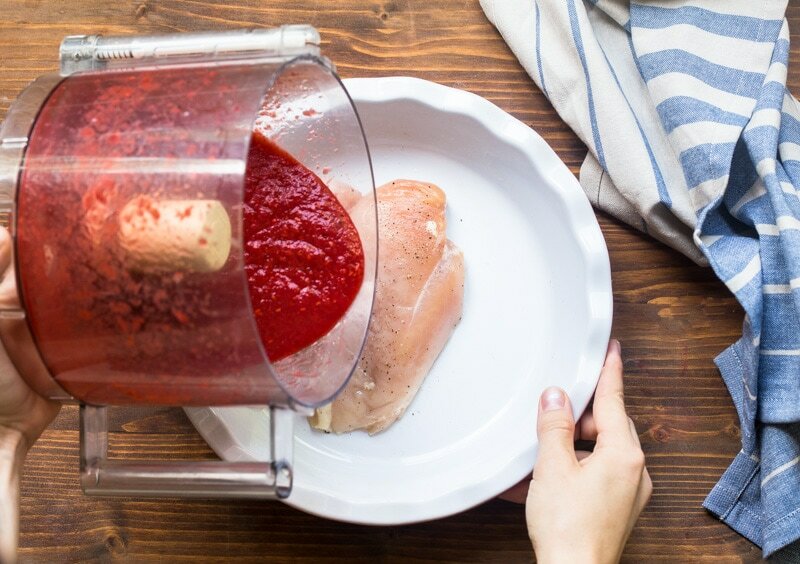 This raspberry chipotle chicken will go into your dinner rotation as soon as you take just one bite. 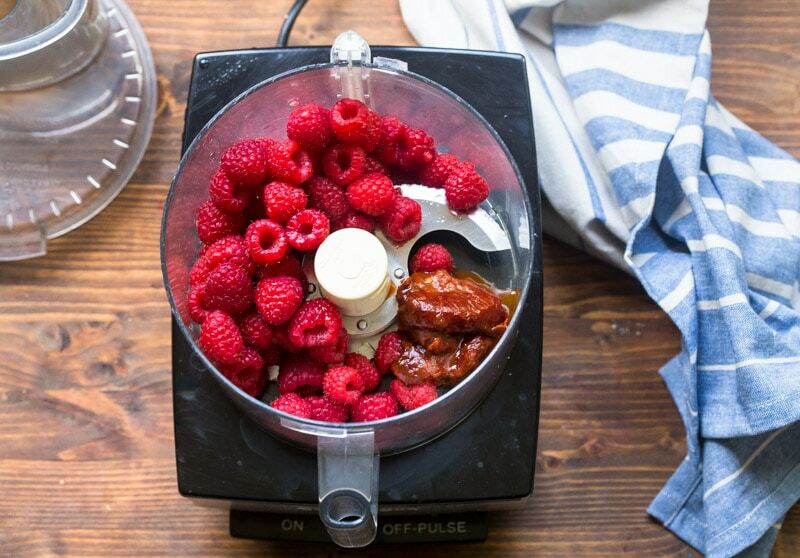 Place the raspberries and chipotle peppers in a food processor, and puree. Taste, and adjust for seasonings (add salt, pepper, sugar, or more chipotles to your liking). Place the chicken in a shallow dish, and cover with about three-quarters of the marinade. Cover and refrigerate for at least 1 hour, but up to 24 hours. Heat a medium skillet over high heat. Add the oil and butter and let melt. When the butter stops sizzling, lower the heat slightly, and add the chicken breasts. Cook the chicken on each side until done, about 5-7 minutes per side. (Test the chicken with a meat thermometer to ensure it reaches 165-F). Meanwhile, heat the beans in a small pot over low heat. When simmering, add a few tablespoons of the raspberry-chipotle puree. Serve the chicken over the beans, with extra sauce on top. 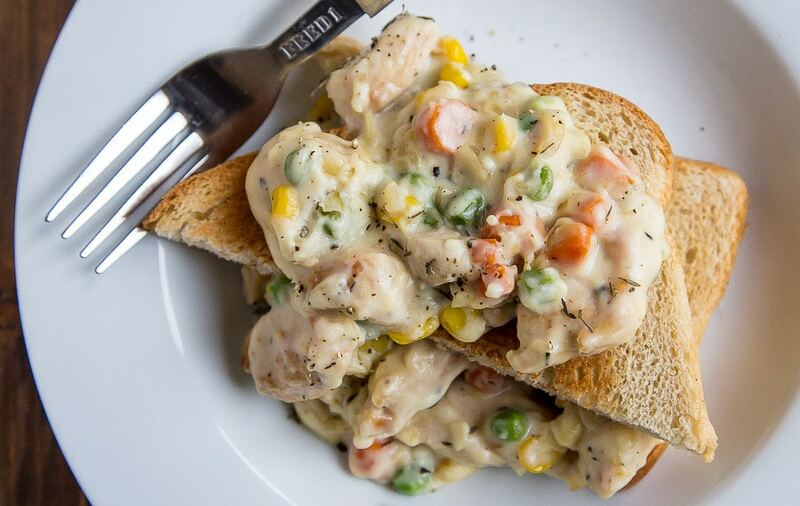 If you’re looking for another easy dinner idea, try my Lazy Girl Chicken Pot Pie. So many great reviews! This recipe sounds interesting, but how are you saying this has 5 ingredients? I count 7: raspberries, chicken, peppers, olive oil, butter, black beans, feta. I assumed butter and olive oil were given. Don’t forget salt and pepper. WOW!! This sounds amazing!! My husband can’t eat chipotle peppers so I usually just forgo them even though I’m a big fan, but I don’t think I’ll be able to skip this recipe!! I can’t wait to try it!! This sounds so yummy! I love your blog! What would you suggest for a side dish?